We are well renowned as one of the distinguished Marble Pedestals Manufacturers and Exporters based in India. The white marble pedestals column is from the high quality Marble as per the national and international quality standards. 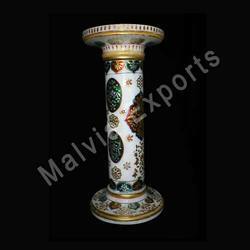 Unique design of the White marble pedestals column makes it the ultimate choice for interior decoration purpose and also an excellent gift item. We are well known exporter of White Marble Pedestals. Designer Marble Pedestals offered is made available by us under item code Mem-086 and comprises designer finish based white pedestals. 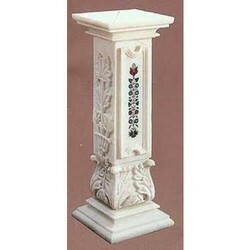 Made available in solid marble finish, these columns are offered in pairs of 30"inch in height. Featuring unique finish designs, these are well distinguished in the markets for their flawless finish values and are highly desired as a perfect choice for interior decoration applications as well as a suitable gift item. 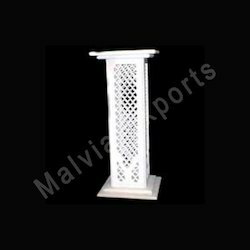 Marble Pedestals offered are made available by us under item code ME019 and comprises white pedestal leaf painted column that is of 24"inch in height. Their exclusive and mesmerizing finish quality makes them highly demanded in the Indian as well as international markets. With these pedestals designed using quality white marble, these are highly suitable choices for interior decoration purposes as well as are also an excellent gift item.